The student completed this task with some teacher support. 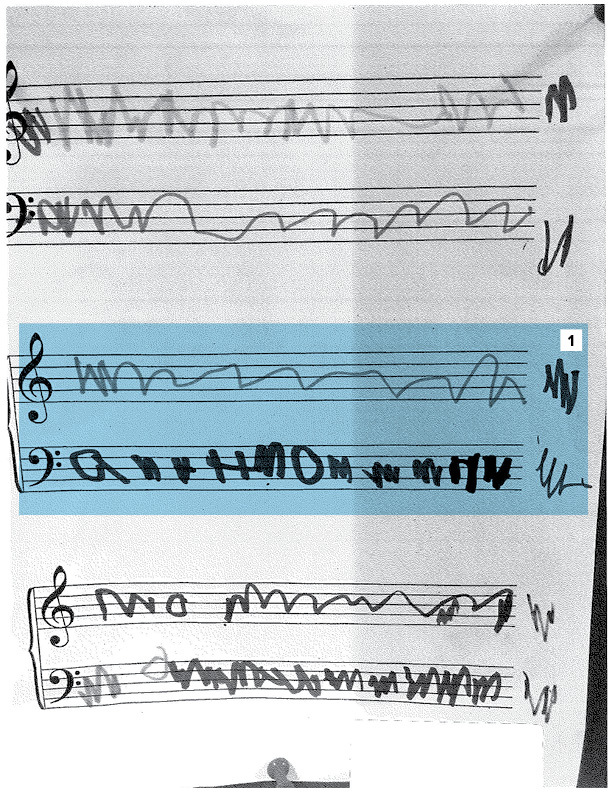 The student was using musical instruments at the music center and singing the song “Dynamite.” The teacher prompted the student to use writing when playing (“What song could you write?”). The student understood the purpose of the writing (“I want to write the song Dynamite”). The teacher supported the student to choose the correct writing paper (“Get the song paper to write your song”). The student was able to name the type of writing used (“I wrote a song”). The student is not proficient in L.K.2c and d because the student does not use any consonant or vowel sounds when writing. L.K.2c: Write a letter or letters for most consonant and short-vowel sounds (phonemes). L.K.2d: Spell simple words phonetically, drawing on knowledge of sound-letter relationships. The student is not proficient in L.K.1a because the student uses scribbles and letter-like forms and does not form letters correctly. L.K.1a: Print many upper- and lowercase letters.